For the first time, four round table discussions will he held during the 2007 General Assembly. This will allow small groups of Council delegates to discuss subjects of mutual interest in a setting conducive to the easy exchange of ideas. Each round table will be limited to no more than 40 participants. When registering for the Council, delegates interested in participating in a discussion will be asked to prioritize their interest in the discussion topics. Assignments to the various round tables will be based as much as possible on these priority interests. In each case, two members of the Bureau will chair and mediate the discussion. In this article, each topic is presented in some detail by the named chair and moderator, allowing them to set the stage for later discussions. The actual sessions will take place on the morning of Friday 10 August. Registration is required. Participation is restricted to delegates attending the Council. Contact your National Adhering Organization or the IUPAC Secretariat for more information. All of the above influences are the nature of concern in all countries, but their relative importance differs from country to country. While the level of understanding of chemistry might not vary too much from country to country, the perception of its importance does. The major, rapidly developing countries in Asia certainly value chemistry as an important key to future development, while European and other Western countries have gone beyond that stage and are more concerned with tighter regulation. There is a link between the emphasis on regulation and a poor community understanding—and particularly appreciation— of chemistry. So this brings us back to the matter of education of the public about chemistry. The issues are also cyclical. A student wishing to become a teacher can choose between chemistry and other science subjects such as mathematics or biology. In many ways, given the available classroom facilities, mathematics and biology would be easier to deliver than chemistry. Without dedicated and stimulating chemistry teachers, it is unlikely that students will be attracted to further chemistry study. If students become genuinely enthusiastic about chemistry, they frequently transfer this enthusiasm to other areas such as the more socially esteemed field of medicine at the tertiary level. While medicine, and indeed biology as a whole, are becoming more molecular in their level of understanding, the importance of a strong chemistry background has not yet emerged in (or in some cases returned to) the relevant medicine and biology curricula. The fundamental chemistry curriculum needs to be strong and well designed. In this respect it arguably needs dramatic revision. Most curricula are designed by chemists who know and understand the importance of chemistry, but fail to justify this importance. A systematic approach usually starts with the fundamentals of the subject, which are not always seen as relevant in the eyes of students. Chemistry teaching needs to start with the basis that we, and indeed the entire world, are just collections of molecules. So perhaps we should start with the molecules of nature, in other words organic chemistry, then move to physical and general chemistry because we need to understand what such molecules are and how they behave. The reasons for studying chemistry need to be made clear at the outset of the educational program—and this means at the primary school level. IUPAC has the mechanisms through the project system to bring together international task groups to gather and assess data, and then to inspire novel and effective approaches to the encouragement of young people into chemistry. There are existing projects that address some of the above points, and these will provide a good basis for discussion. In many worldwide organizations and operations (e.g., the United Nations) smaller countries feel that their voices are not well heard amidst the discussions among big nations. In response, many such organizations are giving smaller countries higher visibility, proportionally more rights and votes (e.g., in their General Assembly), and more assignments in committees and working groups. IUPAC has already done many of these things. Smaller countries in IUPAC’s view are National Adhering Organizations (NAO) with a lower “chemical turnover,” which means a smaller chemical industry. In recent years, large companies have been searching for applied science research opportunities in particular in countries with large populations, sizable education systems, and a nascent chemical industry. IUPAC’s influence could help such companies establish better contacts. In many ways, IUPAC has already understood the needs of smaller countries and responded with special programs, meetings, training, lectures, and scholarships and visiting programs, particularly for young scientists. But is it enough and what else could be done? There is definitely not a “one size fits all needs” solution. A smaller country in Africa may need different assistance than a smaller country in Asia or Eastern Europe. What could IUPAC do to improve general chemistry education in small countries? Can IUPAC help educate the public and government authorities in smaller countries? Could IUPAC play a role as an NGO in concert with ICSU and UNIDO? Does IUPAC have a role to enable smaller countries to develop their own research programs? Is there room for less-sophisticated, lower-technology chemistry, which could be followed by higher-technology chemistry? Can IUPAC provide “first aid” via the internet or with “flying experts, using its pools of volunteers—those specialized in education, environmental sciences, production safety, etc.? chemical libraries and technical and chemical literature? Should IUPAC encourage publishers to provide free access to electronic versions of books? How could IUPAC help bring industry in contact with small countries (e.g., through an affiliated company of a large multinational)? What Can A “Smaller Country” Do to Be Better Heard and Recognized? How can a smaller country explain its needs for scientific and educational programs? Could geographic regions bundle their programs and help each other out? Is there a possibility for seminars to exchange experiences and expertise? Could IUPAC create “clusters of interest” in these geographical regions? How can we ensure that smaller countries—which are equal to any other country—take an active part in the work of IUPAC? Addressing these types of questions in the round table discussion should help us ensure that the every “citizen” in IUPAC has a voice and an adequate platform for their issues and concerns. 1. Do we need more interactions than we have at present? What is their purpose? 2. The topic title lists a number of possibilities for interaction partners. Is this list complete? Are there any other groups we should include in our interactions? 3. What is the most effective way to increase our interactions with each of these groups? 4. What do we expect to get out of our interaction with each of these groups? 5. How aggressively should we pursue formal NGO status with various bodies? Further elaborating on question 1, let us assume the answer is yes and we need more interactions. Perhaps one purpose of these increased interactions is to broaden knowledge of IUPAC’s existence and its role. IUPAC was created in response to a demand from chemical industry for international standards to facilitate patents, trade, and exchanges. Thus, we have become known for terminology, nomenclature, and critically evaluated databases. Should we build on this reputation or should we devote our efforts to letting the world know that IUPAC is much more than just the above three topics? For example, our project system involves close to 1 000 scientists worldwide, we are active in supporting conferences, we are working with the Organization for the Prohibition of Chemical Weapons, and we produce a number of publications. Perhaps we should try to build on our traditional strengths and publicize the breadth of our operations. Additional reasons for increased interactions might include attracting more students to chemistry, increasing the global visibility of chemistry, and enhancing public understanding of chemistry. Are there others? Thinking of questions 2, 3, and 4, let us be reminded that the purpose of ICSU, which was founded in 1931, was to form a coalition of scientific unions that would focus on interdispciplinary science. It has a large number of national members (more than 100), which has produced an interesting dichotomy. 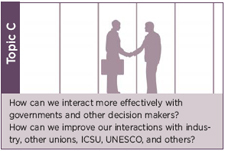 ICSU has some effective interactions with governments and international organizations. Should IUPAC try and take more advantage of ICSU and its governmental and international contacts to broaden the outreach of its own activities? This might be an appropriate time for such an initiative given that the IUPAC president is one of eight elected members of the ICSU Executive. In addition to working through ICSU, should we more aggressively pursue contacts with decision makers directly through IUPAC itself and perhaps through our national committees? We have a number of programs that attempt to involve younger scientists in IUPAC activities. Given the pressures on younger scientists early in their career, is this a group that we should try to interact with more effectively? When we attempt to interact with governments, should we focus on the public understanding of chemistry or should we direct our efforts to the public appreciation of chemistry and to its benefits to society? In interacting directly with the public, are we better to focus on chemistry educators and national associations and support their efforts? The fields of green chemistry and sustainable development are both popular and crowded. Do we have a unique contribution to make and to share with decision makers? With regard to question 5 and IUPAC’s NGO status, let us not forget that through its Committee on Chemistry and Industry (COCI), IUPAC works to include chemical industry more actively in its activities. These efforts have involved strengthening the Company Associates program and a number of other initiatives. For example, we have tried to interact more directly with industry-based organizations. IUPAC can help industry in its attempts to bring rationale discussions and solutions to the attention of government as they relate to chemical problems. However, to do so effectively, we need the cooperation and participation of chemical industry. The Strategic Approach to International Chemicals Management is a policy framework for international action on chemical hazards (see feature on page 8). This is the type of organization where COCI believes it is important for IUPAC to establish official NGO status. We are in the process of doing so. Is such an initiative important and should we seek additional opportunities to associate with other bodies as an NGO? Increasing the global visibility of chemistry, enhancing its public understanding, and improving its public image can all be seen as explicit, central elements of IUPAC’s strategy to “contribute to the worldwide understanding and application of the chemical sciences, to the betterment of the human condition.” The global perspective and networks provided by IUPAC as a worldwide scientific organization should position us well to make a meaningful contribution in each of these areas. But sorting out what IUPAC is best positioned to do relative to the many other players is challenging, and we must avoid confusion between the three important but different goals of enhancing public understanding of chemistry, improving its public image, and improving the visibility and image of IUPAC. IUPAC wants to provide leadership to enable chemists to address global issues that involve the molecular sciences. IUPAC acknowledges that the public ultimately decides whether and to what extent the benefits of chemistry are realized. Chemists therefore need to engage with the public to create a climate in which the potential benefits of chemistry can be realized. To create and support effective two-way communication, chemists need to understand the needs and concerns of the public. Good decision making in society depends on mutual understanding and trust between chemists and the public. IUPAC needs strategies to promote this mutual understanding. Noting that “one size fits all” messages are ineffective, the report addresses the question: Who are the public(s) IUPAC should be trying to reach? IUPAC can be considered to be at the center of a set of concentric circles, each of which represents a “public” with which IUPAC may wish to interact in relation to the public understanding of chemistry. IUPAC is closest to and/or can readily interact with its own adhering bodies and national chemical societies, other multinational organizations, and the scientific and educational arms of national governments. It is relatively remote from most chemists, who are members of national bodies rather than of IUPAC itself, and very remote from teachers, students, and the general public. IUPAC has neither the resources, nor the expertise to address all of these “publics.” It needs to concentrate its activities with those publics with which it is well placed (and perhaps better placed than others), while interacting indirectly with those publics that are more remote (and who are better addressed by others). Primary publics for IUPAC are those chemists who are closely associated with IUPAC, and one of the first steps for IUPAC is to assist its chemist-members in understanding the needs and aspirations of their target audiences. The media and the public will see through any imbalance or confusion of motives and will spot anything that is self-serving. The four recommendations in the report are a good starting point for our round table discussion about IUPAC’s role in PUC initiatives and in enhancing the visibility and public image of chemistry. Recommendation 1: In keeping with its mission to “contribute to the worldwide understanding and application of the chemical sciences, to the betterment of the human condition,” IUPAC has an important role to play in enhancing public understanding of chemistry. Recommendation 2: Public understanding of chemistry activities aimed at supporting teachers and students within the formal school system are more effective than those aimed at the general public. Recommendation 3: IUPAC is just one of many actors in public understanding of science, and will frequently need to work collaboratively with the other scientific unions and other bodies. IUPAC can not cover the full range of possible activities and address all audiences, not least because it is remote from the general public. IUPAC’s primary targeted public should be IUPAC chemists and educators, and IUPAC’s most important role is to help them understand and work with a variety of other publics. 1. What is IUPAC’s motivation in increasing the global visibility of chemistry, enhancing public understanding of chemistry, and improving its public image? How does our motivation as a worldwide scientific organization coincide with and how does it differ from other players such as national chemical societies and chemical industry? 2. Which “publics” is IUPAC closest to, and how are we best positioned to work with those publics to increase the global visibility of chemistry, enhance public understanding of chemistry, and improve its public image? 5. Do we currently do a good job of highlighting the educational dimensions of IUPAC projects, conferences, and activities. Are they visible, intelligible, and useful to teachers and students? How can we improve? 6. How can we best support industrial associations, national chemical societies, NAOs, and other organizations in achieving these goals? 7. What role might an International Year of Chemistry play in achieving these goals? 8. 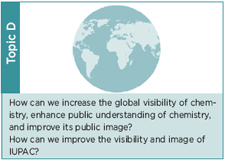 How might the initiatives above be carried out in such a way as to improve the visibility and image of IUPAC? It is a relatively easy task to outline the questions, but much more difficult to provide practical answers. It is hoped that the round table discussions will lead to some really good suggestions and plans for future IUPAC activity.